TSMS Model Schools 6th/7th/8th/9th/10th classes Entrance Exam date revised new exam date is 18-04-2019 : TSMS Model Schools 6th/7th/8th/9th/10th classes Entrance Test Hall Tickets 2019 download @ telanganams.cgg.gov.in : Telangana model school hall ticket 2019-2020 : ts model school hall tickets 2019 download, ts model school 6th class hall ticket download, tsms hall tickets download 2019, ts model school hall ticket 2019 TSMS Model Schools 6th/7th/8th/9th/10th classes Entrance Test Hall Tickets 2019 download @ telanganams.cgg.gov.in . Telangana model school hall ticket 2019-2020 ts model school hall tickets download, ts model school 6th class hall ticket download Telangana Model Schools VIth/ VIIth/ VIIIth/ IXth/ Xth classes admission test Hall tickets 2019 download. TS Model Schools Entrance Test 2019 HallTickets, TSMS CET 2019 Hall Tickets, TSMS 6th to 10th classes Admission Test 2019 Hall Tickets, TSMS Entrance Test 2019 Hall Tickets download. Telangana State Model Schools 6th/7th/8th/9th/10th classes entrance test notification 2019 has been issued in January 2019 by the Telangana State Government, School Education Department, Rashtriya Madhyamik Shiksha Abhiyan and TSMS CET 2019 for admission into 6th/7th/8th/9th/10th classes in Telangana Model Schools for the academic year 2019-2019 for fill up the vacant seats. 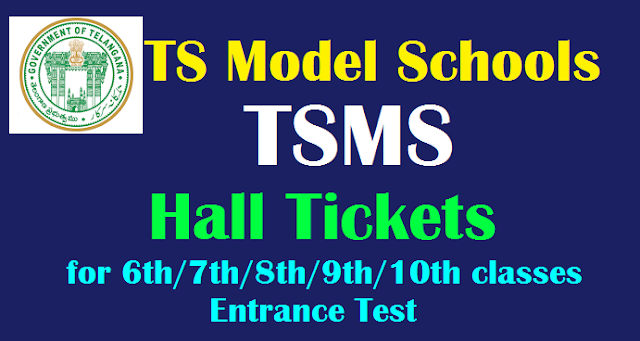 TSMS 6th/7th/8th/9th/10th classes Entrance test Hall tickets 2019 download from this page. Telnlgana Model School Society RMSA, Hyderabad is invited online application forms from the eligible students from 1st February, 2019 to 8th March, 2019. TSMS 6th/7th/8th/9th/10th entrance will be conducted on 18-04-2019 at each mandal head quarters or model schools in all districts of Telangana State and exam will be held from 10.00 AM to 12.00 Noon for 6th class and 2 pm to 4 pm for 7th/8th/9th/10th classes as per its schedule. రాష్ట్రంలోని మోడల్ స్కూళ్లలో ఆరు, ఏడు, పది తరగతుల్లో ప్రవేశాలకు పరీక్షలను ఏప్రిల్ 18న జిల్లాకేంద్రాల్లో నిర్వహిస్తారు. 6వ తరగతికి ఉదయం 10 నుంచి మధ్యాహ్నం 12 గంటల వరకు; ఏడు నుంచి పది తరగతుల్లో ప్రవేశాలకు మధ్యాహ్నం 2 నుంచి సాయంత్రం 4 గంటల వరకు పరీక్షలు నిర్వహించనున్నట్లు పాఠశాలవిద్య డైరెక్టర్ ఒక ప్రకటనలో పేర్కొన్నారు. TS students, who wish to take admissions in the Telangana Model Schools, they should write he tsms 6th/7th/8th/9th/10th classes entrance examination to get qualified for admissions. So, 5th/6th/7th/8th/9th classes passed eligible students were applied for this entrance stream through online mode for appearing the tsms cet 2019 and they are waiting for their hall tickets. Candidates can download their hall tickets from the given following link. 2. Click on the "Download VI Hall ticket/ Download VII-To-X Hall ticket"
3. A New Window will be Opened. 5. Now Download your hall ticket and take a printout. 6. Don't forget to brought hall tickets to exam hall and Preserve your hall ticket upto completion of admissions process 2019-20.